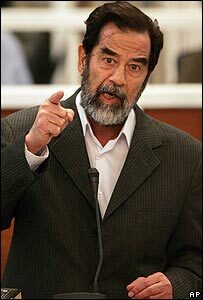 Perhaps it's just me, but I'm afraid that I can't help but be amused by Saddam Hussein's display of defiance in the court where he is being tried for genocide, war crimes and 'crimes against humanity'. Just as he did at his last trial, Saddam refused to enter a plea, wouldn't give his name and dismissed the trial as a "court of occupation". Well, he's right, isn't he? It's not that I have any great sympathy for Saddam, or that I am some kind of apologist for his regime. Far from it. What amuses me is the whole pretence that somehow this is anything other than a kangaroo court. Saddam was only toppled from power by a US invasion and subsequent occupation of Iraq. He is only facing trial because the present Iraqi regime is being propped up by US military might and because the USA need to see their invasion justified by the formal legal demonisation of the former Iraqi president. The USA is a democracy, you see. The new Iraqi regime is a democracy. This is how democracies deal with things. It's all about the application of law and the meting out of Justice. All Saddam has to do is turn up, be found guilty and be executed. So what's in it for him exactly? Why should he recognise the authority of this court, or of the Iraqi Government, or of the US occupation? What he says or does in this trial will not make a damn bit of difference to the verdict, as he will surely be found guilty. So why not make a show of it and go down fighting? It's not that I think Saddam wasn't involved in genocide, war crimes or 'crimes against humanity' (and that's a nice vague and mutable charge, isn't it? who decides what's included in that? how do you prove it?) - I think it's almost certain that he was. It's just that I think it's hypocritical to go through the motions like this and to pretend that it is anything other than a show trial being run by the USA for public consumption. Justice (...and dinner) are served. It's pretty sickening, isn't it, the utter hypocracy of the situation? If you look on the Texan penetentiary website it lists the final statements of those executed. an awful lot of them seem to have found God in that there Christian Jail. I suppose if I was in Saddam's position, I would be probably be as disruptive as possible and having a laugh. "He is right. He's also a tiddler in the ocean of evil world leaders"
I'd definitely be having a laugh with proceedings if I were in his situation.